[Lauren Shelburne | Banner] Maria Fiore, sophomore visual arts major, relaxes on the interactive exhibit her classmates created for the PARK(ing) Day event. 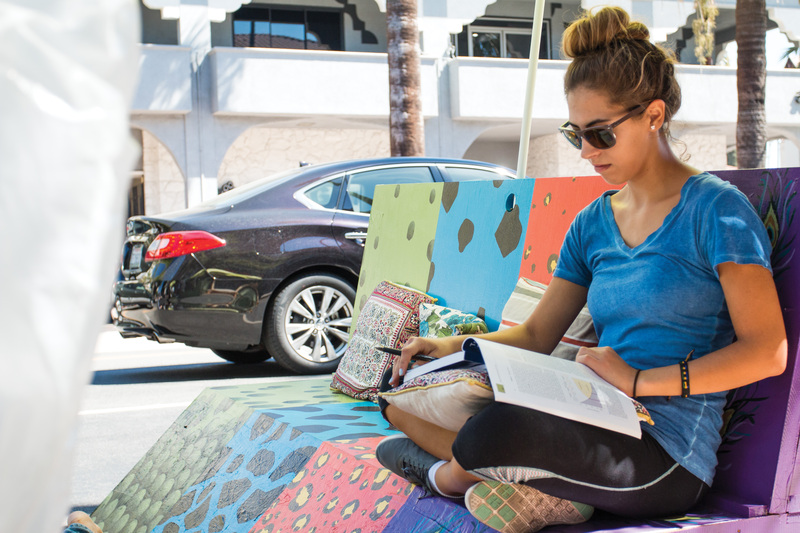 With the increase in development of cities across America, local artists and the environmentally conscious banded together to celebrate PARK(ing) Day to transform metered parking spaces into temporary parks, art pieces and ways to get involved in the community. In 2005, Rebar, a San Francisco art and design studio, wanted to make a change. They noticed a shocking 70 percent of San Francisco’s downtown outdoor space was allotted for cars. They paid the fare for a two-hour parking space and set up a park complete with grass, trees and a bench. After photos of the installation circulated, cities began requesting Rebar to set up similar “parks” in their cities. The company opened the event idea to everyone and created a guide for how cities across the nation can have their own PARK(ing) Day the third Friday of September. PARK(ing) Day is now a global event, extending to places like Hong Kong and Santo Domingo. This is the first year the Arts & Cultural Affairs Division of Riverside has run the celebration, with the California Baptist University Visual Arts Department joining for the first time. Megan Elder, CBU alumna and public policy fellow for the Western Riverside Council of Governments, led the event. The official website for the PARK(ing) Day event explains its actual goal. “The mission of PARK(ing) Day is to call attention to the need for more urban open space, to generate critical debate around how public space is created and allocated, and to improve the quality of urban human habitat … at habitat … at least until the meter runs out,” the website said. Kristi Lippire, assistant professor of visual arts and adviser for the Art Club, began planning an installation with her students the first week of classes. Inspired by a large inflatable giraffe and narwhal Lippire already had, the students decided on a zoo theme for their park, complete with animal print-covered chairs. The chairs were constructed by old doors Lippire had obtained from a friend two years earlier. She said they wanted to incorporate seating to fit the original park idea of the event. The Visual Arts Department was joined by the Riverside Police Department, Foster Army Animal Rescue, local dancers and other organizations to help residents get involved in the community. The department’s participation allowed students to learn more about the city they call home, while adding to their portfolio.